The cool thing about big project is that there are so many details and little places where one can contribute. After some days playing with Gzweb and looking into the code, I noticed that if you wanted rotate an object, you had to go into translate mode and then press ‘r’ on your keyboard. Gazebo has both rotate and translate buttons, which is more intuitive, so I thought it would be nice if Gzweb had one too. It’s also good for my project, since a mobile version can’t rely on keyboard commands.The first thing I did was to go to Gzweb’s repository in Bitbucket and create an issue, which is a way to tell the people who are interested in Gzweb that I think a rotate button would be a nice feature to add. Then I started looking into how to add it myself. To change something in Gzweb, I must have it in my computer, modify it until I’m satisfied, and then send the modification to be scrutinized by the community. The installation of Gzweb involves installing Gazebo and other dependencies, all detailed in the Gazebo wiki. The readme files within Gzweb are also helpful. I’m not going to detail how to fork the Gzweb repository and clone it to your machine since there are plenty of resources online for that. Since we’re on the web, I started with index.html. I knew my rotate button would be very similar to the translate one that is already there, so I just duplicated the translate button and renamed it rotate. I knew that the interface had to be connected to gzgui.js since GUI means Graphical User Interface. So I opened it and searched for “translate”. In fact, there was some stuff written about the translate button, so I just duplicated all of it and made it into rotate. I had a vague idea that I’d need to edit a CSS file somewhere, but there are a few of them in the project. To find out which one it was, I made a search for which files within the project contained the text ‘toolbar-translate’ from the snippet above (one thing keeps pulling the next, as you’ll see). I did that using grep on the Linux command line. The -r flag tells it to look at all the sub-directories of the path given and -l tells it not to print the line where the text is contained, just give me the file names. It seems like I need a rotate.png image for the button icon. I went to the Gazebo repository and took the one they had there, since the icons seem to be the same. All other icons on Gzweb were 16×16 pixels, so I resized the new icon with Inkscape and saved it in the same folder as the rest (/gzweb/gz3d/client/style/images). So I have a button, but pressing it does nothing. The next clue I followed was the manipulation_mode event that is emitted by gzgui.js. Before, it could only emit ‘view’ or ‘translate’, but I added a third option ‘rotate’. A quick grep search told me that manipulation_mode is only found within gzgui.js itself and gz3d.js and gz3d.min.js. 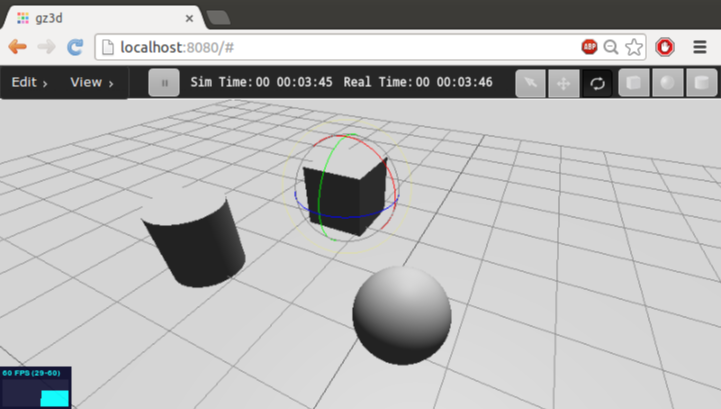 A little parenthesis here about gz3d.js and gz3d.min.js. As I understand it, these files should never be edited directly. As the readme file in gzweb/gz3d says, you gotta use grunt to “concatenate and minimize the files under src and replace gzweb.js and gzweb.min.js in the `gzweb/gz3d/build` directory.” So it is expected that whatever is in the other files under src, such as gzgui.js, will also end up inside these two files. So this setManipulationMode function is the one handling the mode changes. I need to follow it to see what’s happening with the already existing ‘view’ and ‘translate’ modes and see where I can fit my new ‘rotate’ mode. And grep tells us to look into gzscene.js. So it seems that when we go into view mode, a bunch of things are killed and removed. One can only guess that all the things being thrown away are related to the translate mode. This is treating translate and rotate the same way. Remember, rotate is already implemented somewhere, but only accessible by keyboard. I want to find how the keyboard triggers it and use the same functions for my button to trigger it. Afterwards, I just sent the pull request and waited. Now, only in case of view mode the tools get detached. Otherwise, the mode is updated. That’s all. I pushed the new changes to my repository and edited the pull request. Eventually it got approved and my new button is now part of Gzweb! I hope the general flow was clear though: I started from a place I knew and followed the clues on the code from there. It wasn’t necessary for me to understand every single bit of the code. But it was important to know how to navigate within it and search for what I needed. For example, a grep search for “translate” doesn’t help much since it’s written all over the code with various meanings. Not sure if this is a nice method, but for this newbie here it worked 🙂 I don’t think this is the only way to approach unknown code though, this was a particular situation where I just had to make a few changes to get what I wanted. Nevertheless, in the process I also got more familiar with the structure of Gzweb, which is very important, since I want to insert Gzweb mobile into it in a coherent way.